The detailed design for the Thirty Meter Telescope (TMT) developed by a U.S.-Canadian team is capable of delivering on the full promise of its enormous light-collecting area, according to the findings of an independent panel of experts. With the TMT, astronomers will be able to analyze the light from the first stars born after the Big Bang, directly observe the formation and evolution of galaxies, see planets around nearby stars, and make observations that test fundamental laws of physics. "The successful completion of our Conceptual Design Review means that the TMT has a strong science vision, good technical requirements, a thoroughly reviewed design and a powerful team to carry our work forward," says Project Manager Gary Sanders. Now in detailed design, the TMT is a concept for the world’s largest telescope. It consists of a primary mirror with 738 individual 1.2-meter segments that span 30 meters in total, three times the effective diameter of the current largest telescopes. All of the segments will be under exquisite computer control so that they work together as a single mirror. The review panel evaluated all aspects of the project, including its optical design, the telescope structure, science instrumentation, site testing, management and cost estimate procedures. The panel was positive on nearly all fronts and praised in particular the adaptive optics technology being planned for the giant telescope. Adaptive optics will allow the TMT to reach the “diffraction limit,” comparable to a telescope’s resolution in space. TMT project engineers are integrating this system with the designs for the eight science instruments under detailed study, so the power of the adaptive optics system should be available at the beginning of the telescope’s science operations in 2016, the external panel reported following the May 8-11 conceptual design review. The baseline adaptive optics (AO) system for TMT involves nine laser beams that are launched from a small telescope at the peak of the structure that supports the telescope’s secondary mirror. These laser beams reflect off a layer of sodium gas high in Earth’s upper atmosphere to provide artificial points of light analogous to distant stars. These point-like laser reflections drift and wobble just like the star light, giving the AO system reference points to use anywhere in the sky as it compensates for distortions of the star light by Earth’s ever-changing atmosphere. This technology has been pioneered at the Lick Observatory, the Gemini Observatory 8-meter telescopes and the Keck Observatory 10-meter telescopes. TMT is also studying the potential for an adaptive secondary mirror for the telescope. This would involve covering the bottom of a flexible glass surface as large as the primary mirror in many current telescopes (a concave hemisphere 3.6 meters in diameter) with hundreds of tiny pistons to push and pull the surface of the mirror in minute increments. A computer controls these movements many times per second, as it works to adjust the mirror so it has the exact opposite shape of the distortions in the incoming star light. Much of the TMT’s scientific work will be done in the infrared, where the diffraction limit is easier to attain, young stars and galaxies are to be found, and the opportunities for new discoveries are abundant. The eight scientific instruments in detailed design for the TMT are huge in comparison to current-generation astronomical instruments, and equivalently more complex. Each instrument is the size of school bus or larger, and they rest on two platforms on either side of the telescope that are each the size of a basketball court. The biggest technical challenge among the instruments is the Planetary Formation Instrument, which employs “extreme” adaptive optics in an effort to directly image other planets, the board found. The technical requirements for the telescope, its structure, and its control system are clear and appropriate for this stage of the project, the review board found. 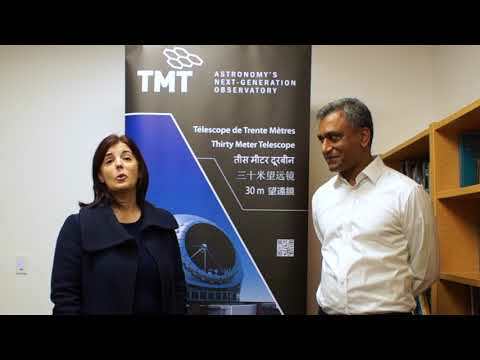 The TMT is a collaboration between the California Institute of Technology, the University of California, the Association of Universities for Research in Astronomy, Inc. (AURA) via the U.S. national observatory, and the Association of Canadian Universities for Research in Astronomy (ACURA), with significant work being done by industry and by university teams studying instrument designs. Canadians welcome the external panel’s endorsement of the depth and quality of the TMT design work. “We look forward to supplying the enclosure, telescope structure and adaptive optics system in time for first science,” says Ray Carlberg of the University of Toronto, the Canadian project director for ACURA, an association of 24 Canadian universities in partnership with the National Research Council of Canada. The design and development phase of the TMT project has a budget of $64 million, including $35 million in private sector contributions from the Gordon and Betty Moore Foundation. The conceptual design review board found that the project is estimating the cost of the TMT using up-to-date industry standards. A formal cost review of the project is scheduled for September 2006. The TMT project is studying five sites in Chile, Hawaii and Mexico as possible locations for the telescope. The project office is currently based in Pasadena, CA, where the conceptual design review was held. Edward Stone, chair of the TMT Board of Directors and former director of NASA’s Jet Propulsion Laboratory, is available to answer media questions about the conceptual design review and the status of this exciting project. The TMT is designed to meet the scientific goals of the Giant Segmented Mirror Telescope concept, which was the highest priority ground-based project in the most recent astronomy decadal survey conducted by the National Academy of Sciences, published in 2000.